OOOPS! Sorry, I forgot to post the link. Just posted it now! If the form proves useful and you want one with heaps more cells and lines then drop us a message either me or via Andy on this site. 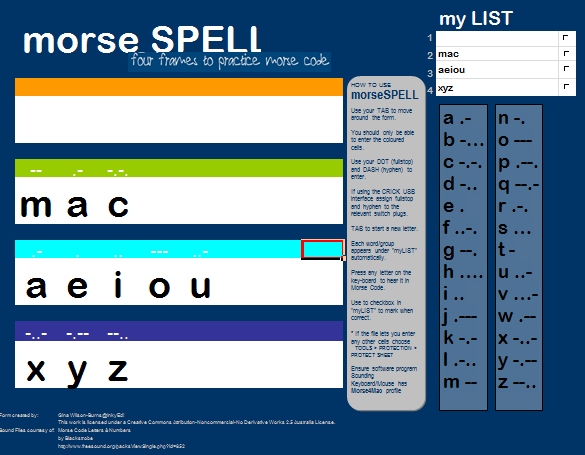 I have one that allows for a lot more text, heaps more cells, doesn’t have the spelling list box or instructions. I have a numbers one kicking around somewhere too but we decided not to pursue morse numbers as they were so long and have taught Mac the short form numbers so that he can change into a ‘number mode’ eventually for quicker entering.